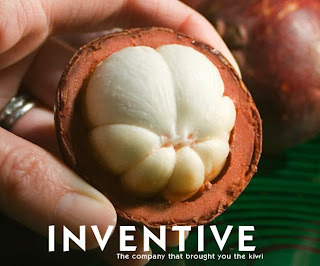 Imagine the most succulent, mouthwatering exotic fruit you’ve ever tasted and you’ve pretty much summed up the Mangosteen. This tropical delight has only recently made its debut in the United States, and Frieda’s Specialty Produce is one of a handful of U.S. companies able to share the joy! And the Mangosteen is not just about flavor. This hot new fruit is also one of the trendiest “super fruits” around. You might see Mangosteen juice alongside acai juice or noni in the health food store, and sometimes you can find dried or freeze-dried fruit, but of course, nothing beats fresh, whole Mangosteen. Many believe that the woody purplish rind is what contains most of the antioxidants (and phytochemicals called “xanthones”), so liquid Mangosteen supplements are often made with the whole fruit, rind included. If you are looking to purchase this tropical gem, don’t be surprised by the price tag. After it’s harvested in Thailand, the fruit must be irradiated before entering the U.S. (a USDA mandate). Select a fruit that gives slightly to gentle pressure on the outer shell. To eat a fresh Mangosteen, carefully score the outer shell around the “equator” of the fruit, then gently remove the top half. Pull out the juicy segments with a fork and enjoy a taste of paradise.